Alphabets of Desire | Full. Body. Transplant. Alphabets of Desire: Chakra Kabbalah Eight-Circuit Reality Creators Anonymous. Today’s nugget of wisdom from Alphabets of Desire is solid alchemical gold. Whether you study Kabballah or tune your Chakras or practice the Karma Mechanics of the Eight-Circuit model, you can create your own reality. A is derived from the Greek alpha, with the modern capital adapted from the earlier North Semitic aleph, said to have been winged in its initial form. A is for Alexandria where at the hinges of the first millennium were Hebrew scholars blowing dust from brittle scrolls, Phythagorean parchments that described creation in ten spheres which corresponded with their base-ten system of arithmetic. 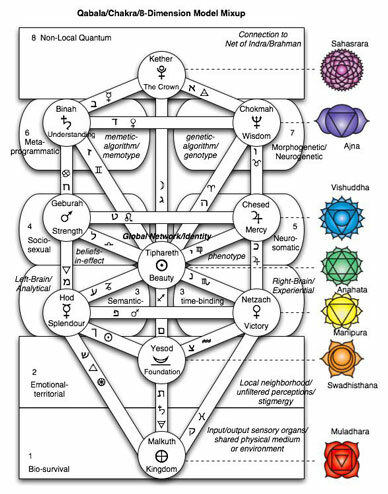 By adding twenty-two lines to connect the numbered globes with one another, one line for each letter in the Hebrew alphabet, they could combine all the components of their world, its numbers and its letters, in a single memorable symbol called the Tree of Life that would provide a basis for all the all-inclusive knowledge system known as the Kabbalah. Centuries thereafter, in Prague, lived two fabled rabbis who maintained that by manipulation of the kabbalistic lexicon they’d conjured a lamb dinner with full trimmings, every night for many years. Arranging letters in a certain order they’d evoked the minted sizzle of the tender flesh, a slight resistance in the roasted skin of vegetables that yields to a serrated edge, exposes steaming fluff within. A slippery marbling on the meniscus of the gravy and the scent of hot bread rolls cracked open. Every forkful of the lean and flaking meat glazes the lips with grease and next a warming slither in the gullet that’s suffused throughout our grateful centre. Recombining letters, they had entered the pure magic of creation. Spelling, they had cast a savoury and aromatic spell in words so delicately seasoned they were edible. Magical systems such as Kabbalah distill the creative potential of life into its basic structures. The tower of human potential can be built all the way up. Alan Moore’s incomparable riff goes way beyond any ability I have to explain these powers. He condensed two centuries into two paragraphs while making the reader’s mouth water for emphasis. I am humbled. 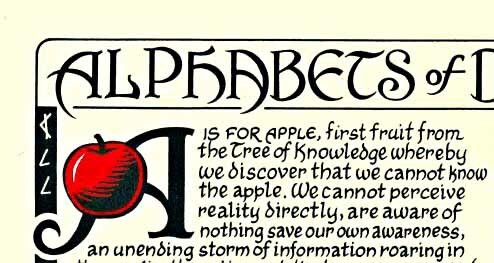 Alphabets of Desire: An Introduction. Alan Moore is one of the loudest bulbs in the human lightshow. Todd Klein gets my vote for Best Comic Book Lettering of All Time. 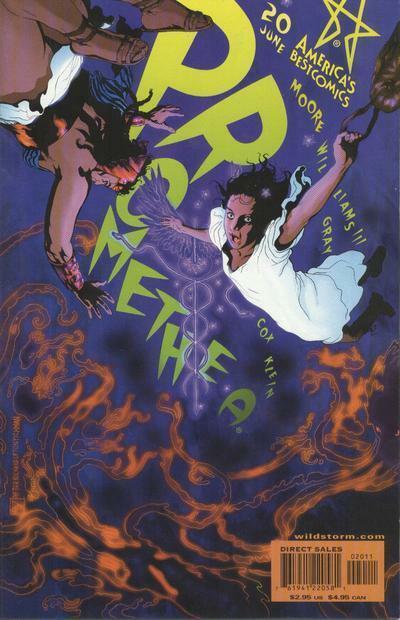 The series of myths called Promethea has never been surpassed, and it was the first time I was exposed to the collaboration of these two masters. It is a spectacular tome of magick written by Alan Moore. 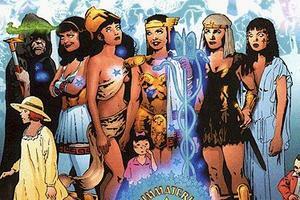 Promethea was fleshed by the drawings of J.H. 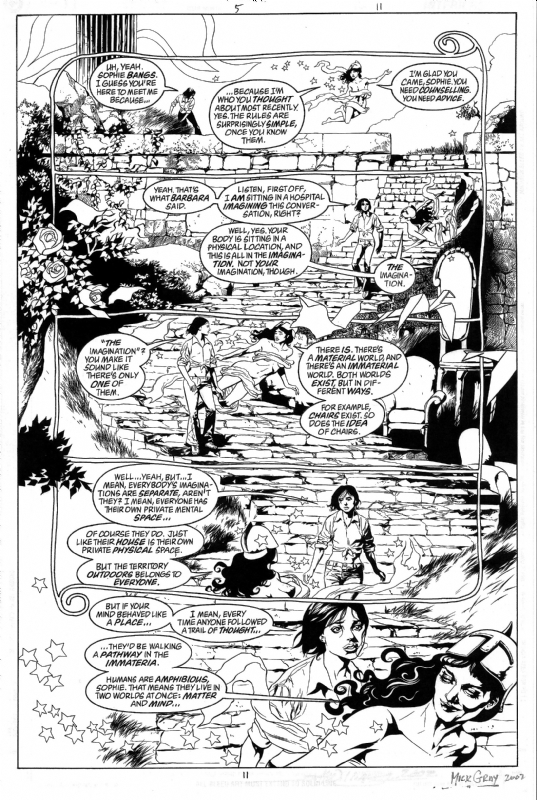 Williams III, the ink of Mick Gray, the colors of Jeremy Cox, and the lettering of Todd Klein. Promethea completed her mission in 32 issues and quit while she was ahead. Still glowing with appreciation, I figured it was a once-in-a-lifetime experience. Then, yesterday, I stumbled upon a gem of equal brilliance. 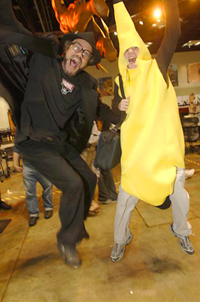 Two of her mad genius creators joined forces again last year for more. It is called Alphabets of Desire. That is a term spelled out by Austin Osman Spare himself. 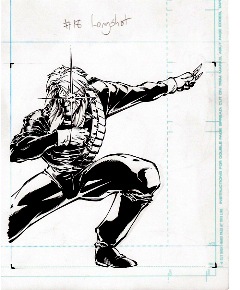 It is a poster, written by Alan Moore and lettered by Todd Klein. It is amazing. I will be expanding each sentence of the piece here on the blog in the coming weeks. The words are deep and dense and hard to digest, so I would like to break them down and clarify the broth. For myself, and for you. For now, I will leave you with the full story of the creation of Alphabets of Desire in Todd Klein’s own words. Click the link in his first paragraph to purchase a print for your very own, enjoy the photograph of Todd and Alan following his incredible tale, and tune in tomorrow for the first three sentences dissected. I’m proud to announce the publication of ALPHABETS OF DESIRE, an 11 by 17 inch print, with newly written text by Alan Moore, design and lettering by me. This is the secret project that I’ve been working on for the last few months, and it’s now on sale exclusively on this website HERE. How did it come to be? You’re about to read the complete story. I launched my website and blog on July 3rd of this year, and as part of it I included some items for sale: two prints I produced in the 1990s, the book I co-authored on lettering and coloring, some original lettering on overlays, and two music CDs. The first week sales were brisk, and I made enough to recover most of my setup costs for the site, so I was very pleased. The second week sales were pretty good, the third week so-so. By the middle of August, they’d trailed off to almost none. Obviously the old stuff had reached everyone who wanted it. I began to think about producing something new to sell. 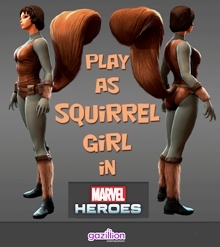 But, what? Another Lettering Sampler? I’d done that, and a variation didn’t seem likely to be a big success. Then the thought came: what if I asked one of the writers I work with to write something for me to letter? Call in a favor, so to speak. The most obvious choices were Neil Gaiman or Alan Moore, but Neil is always so busy, and usually gallivanting around the globe on promotional or signing tours. Alan seemed like the one to approach first. He’s usually home, he usually answers the phone when I call him. The worst that could happen was that he’d say no. 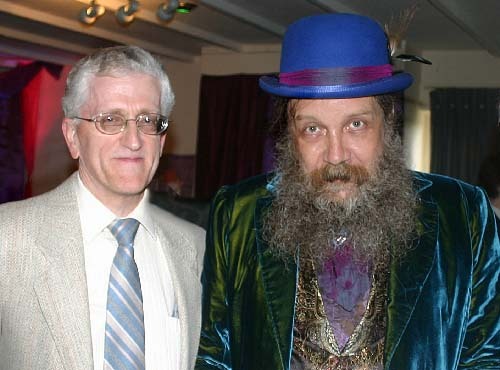 For anyone who doesn’t know, Alan Moore is one of the most acclaimed writiers in comics history, for titles such as WATCHMEN, V FOR VENDETTA, FROM HELL, PROMETHEA, and THE LEAGUE OF EXTRAORDINARY GENTLEMEN. Alan and I have only met in person twice, the second time at his wedding to Melinda Gebbie this past May, photo above, but we’ve had a great working relationship for many years. Still, it took me a few weeks to get up the nerve to call him about writing something for me. I finally did in mid September, and his reaction was very encouraging. He thought it sounded like a great idea. “You may have to call me a few times and remind me about it,” he said. He was busy working on his new novel and another project. But when I explained that I wanted something new to sell on my site, he volunteered, “If we both sign it, I’m sure it will do well.” That made me very happy indeed, as I wasn’t sure if he’d be willing to do that. I began to think this might actually work! That night I told Ellen, “I believe he’s really going to write something for me!” I was over the moon. I called Alan a few more times, as he’d suggested, to remind him. The third time, in early October, he surprised me by saying, “I’ve just started working on it,” and read me the first paragraph, the one that begins with “A is for Apple.” I thought it sounded wonderful. “Can you get it to me by the end of October?” I asked. “I’d like to have it ready to sell in December, and that should give me enough time.” Alan said he should be able to do that. About another week later, in mid October, my fax machine spit out a few pages. As I read through it, I began to smile and then laugh with amazement. It was perfect, much better than anything I’d imagined. I called him, and he said he’d just been reading it to Melinda. I told him how thrilled and pleased I was. “What does Melinda think?” I asked. “She’s on tenterhooks, waiting for the finish,” he said with his usual dry wit. I thanked him profusely and said I’d get to work. So, now I had the text, and the rest was up to me. Over the next week I laid it out on an 11 by 17 inch piece of art paper. I knew I wanted a decorative title and credits at the top, and to begin, a large letter A. Putting an apple there was an obvious choice, and allowed me to enliven the text with a small bit of art that I later hand-painted red on each print. Around the outside, as I had mentioned to Alan, I thought a border using various old alphabets would look good. But rather than just random letters, I wanted them to say something. I drew elements from Alan’s text for that. I hasten to add that I didn’t translate them into other languages, just copied them out in other alphabets. So don’t email me about the Greek, please, I know it’s not Greek words. (But in old manuscripts from the middle ages, this sort of thing was sometimes done, so I think I have a precedent.) All those elements, the titles and border, I pencilled, then inked with my smallest-point technical drawing pen. For the text itself, I chose a wedge-tipped Speedball dip-pen and thought I’d use my calligraphic style of lettering. That seemed the best way to go. It took several attempts to lay it all out in pencil before I was happy, then I went on to ink. I worked on it over several days, between other jobs. 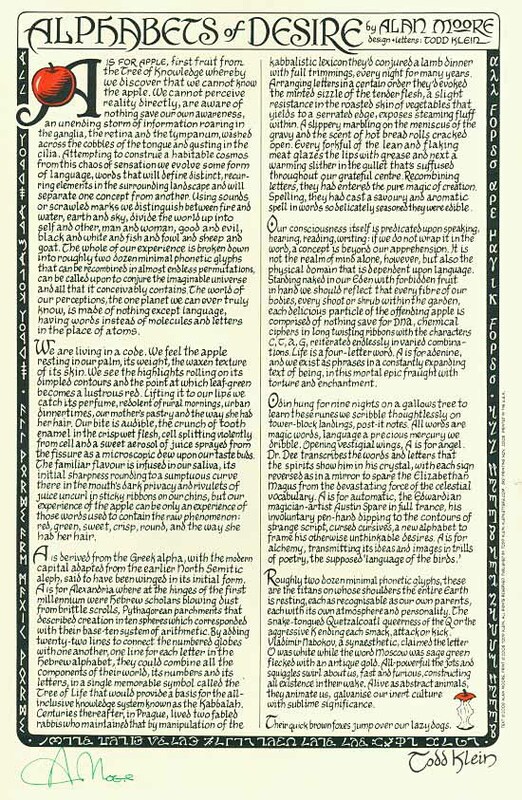 When I’d done the best I could, I scanned the result at high resolution, made small corrections where needed, and reversed the outer border so that the black letters became white letters on black. It was time to order paper, and I found a good source online for that. I wanted something thicker than regular copy paper, but not so thick it’d be hard to roll, as I planned to ship the prints in mailing tubes. I settled on a 67 pound Bristol Vellum, and hoped it was the right choice, as I had to buy it sight unseen. Alan had agreed to sign 500 copies, but I bought 1000 sheets, to allow for printing damage and so on. I wanted to try to print them myself on my own 11 by 17 laser printer, but I wasn’t sure if that would work, as it doesn’t always handle large paper well. I might need to have it printed elsewhere. The paper arrived, and it was just what I wanted, the perfect thickness, and an attractive cream color. I set up the art file and paper for printing, and gave it a go. Amazingly, my printer hardly messed up at all, I was able to print the entire run with barely a hiccup, though I did have to hand-feed each sheet into the printer. Now I had the prints, and needed to color the apples, the big one at upper left, and a small part of the apple core at lower right. I found a cherry red acrylic ink that seemed right for the job, and spent parts of another few days painting apples. This proved very relaxing and therapeutic, though I kept thinking of that scene in Disney’s “Alice in Wonderland” where the cards are “painting the roses red,” and hoping I wasn’t ruining the whole project. In the end, I think the red works fine. Another day or two spent signing my name to the lower right with a wedge-tipped marker, and I was ready to send them to Alan. This was the most nerve-racking part of the job. I packed the prints well, wrapping them in bubble-wrap, then in the original paper box, then in a larger box around that. I thought that would work, but if the prints were lost or damaged in transit to Alan, or worse yet, back to me after he’d signed them, I’d have to start over. I couldn’t afford the time to carry them to England myself, so shipping them was the only alternative. I sent them off, letting Alan know they were on the way. I put off calling for almost two weeks, not wanting to bug him, but when I did call, Alan told me they’d arrived safely, he’d finished signing them, and would mail them back to me the following day. “I signed with a red Biro, thought that would look good,” he told me. Anything he wants, I thought to myself, anything at all. Another week and a few days went by, with me worrying, and then, finally, the package was here. A little worse for the two trips, but when I opened it, the prints were fine, and oh, so delightfully added to in red Biro! All that remained was to write my press release, prepare some prints for mailing, write this blog entry, and then sit back and wait for orders. I’m excited about this venture, the first time I’ve tried something quite like this. 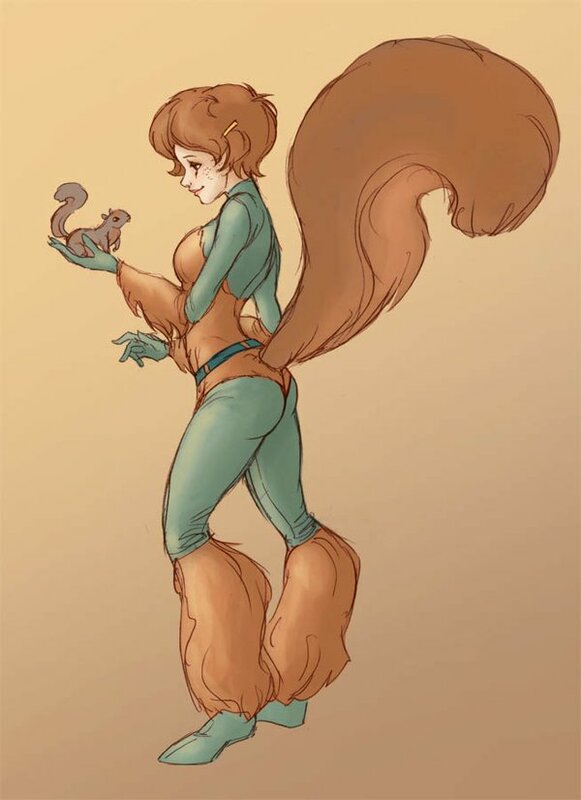 I have no idea how the print will sell or be received, but I’m hopeful. If it does well, perhaps I’ll do more. Egad, would that make me a publisher?! In a small way, yes, I suppose it would. Please don’t hold it against me, okay? Examination of text Part One. Examination of text Part Two. Examination of text Part Three.